Apparently there are a load of novice pet photographers out there. And guess where they all were on Sunday afternoon? On Twitter at our #SuperDogPics Twitter Party! We had a great time sharing tips between the participants' ideas and those of my co-host, Dogtipper, and our guest expert, Brett Chisholm, Publisher of Life+Dog. I saved the party Tweets to a file and plan to reread them all--sort of my self-help work for this week! Maybe I'll share an assortment of the ideas with you in a post, so watch for that. It could be very helpful in your efforts to get a good pic for your Super Dog Sunday photo contest entry. @Shiloh777 got lucky and snagged Prize #1 which included the Live Caricature done during the Twitter Party by our guest artist, Missy Johnson, of Dogs for the PAWS and Art and Dog Design. We all enjoyed watching her progress, as Missy posted updates of her sketching. @CrazyDogMama surprised me when I learned her true identity--a well-known reader whose Twitter handle I had never connected with. All of our winners, including this one, received 3 bags of Terra Paws Sweet Potato treats! 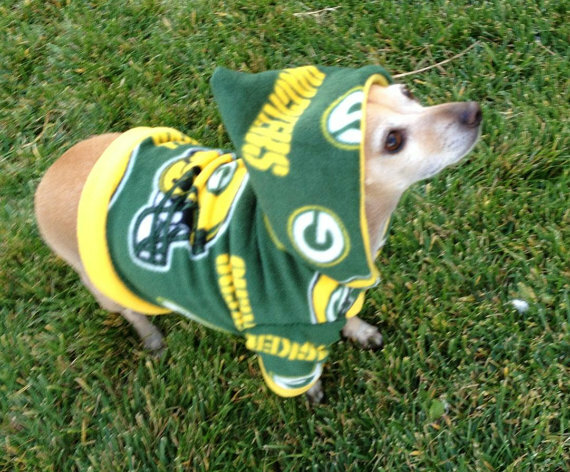 @Griswald60 took a nice assortment of goodies including a cool NFL collar for Fido. @lakuti was one of the lucky winners of an NFL jersey or cheerleader dress from @SugarChic, a prize provider. Great stuff from Sugar Chic Couture. @gfaccenetti lucked upon a year's subscription to Life+Dog magazine, among other prizes in her package. @PixelBlueEyes will be enjoying an adorable plush football toy from sponsors @Dogtipper and @AllThingsDog, with a bunch of other great goodies. @Cynth201: This winner's collection includes Arenus botanicals, from our prize provider that makes a multitude of great products for dog health and behavior. @IslandSnoopy got a giftbag from Dogs for the PAWS, our guest artist, that includes a string backpack, dog bowl and a cool retro slap bracelet. So cute! @JoeJ8948 won the NFL fleece hoodie donated by Etsy shop Gypsy Eyes Clothing. She makes the most adorable stuff. 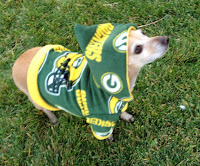 Watch for Oliver's Packers hoodie in upcoming photos. @ShellChis won the first of our "Take a Bow" prizes from the Super Dog Sunday charitable sponsors: the Citizen Canine dog carryall by Tom Bihn. @Angelysty took the prize from our Wag sponsor, the bank for dog lovers, receiving an autographed copy of Secrets of a Working Dog, among other prizes. @njweitzel will have a happy dog when her 2 bags of Gringa Loka peanut butter cookies for dogs arrive. I'm sure she'll enjoy the rest of her prizes too! @Mom4everever was the winner of our PetHub silver membership and tag from this QR code-inspired company. 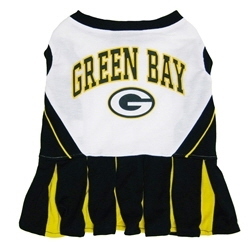 @KirbytheDorkie took the Grand Prize which included 3 bags of Terra Paws, a caricature of her dog, one year of Life+Dog magazine, Arenus flower essences, a plush football toy, and an NFL jersey or cheerleader dress of her choice. What do you think of these prizes? This is just a cameo sketch of the total list, but WOW, was it a prize-laden party. Our participants who joined us to ask photography questions were pleasantly surprised when they also won great gifts. Now that's my idea of a cool party. Hope to see you all next time. Happy tails! Hi Carrie! So sorry that we didn't get a chance to participate in the twitter party...sometimes life just gets in the way...anyway...glad everyone enjoyed it!! A very nice party and a great synopsis of gifts.